You've added The Brazen Head, Christ Church Cathedral, Dublinia: Experience Viking and Medieval Dublin, and other attractions to your itinerary. On the 19th (Sat), brush up on your knowledge of spirits at Jameson Distillery Bow St, get a taste of local nightlife at The Brazen Head, take a stroll through Grafton Street, then see the interesting displays at Dublinia: Experience Viking and Medieval Dublin, and finally contemplate in the serene atmosphere at Christ Church Cathedral. Get ready for a full day of sightseeing on the next day: sample the tasty concoctions at Guinness Storehouse, then get engrossed in the history at Dublin Castle, then don't miss a visit to Temple Bar, and finally snap pictures at Ha'penny Bridge. For other places to visit, where to stay, traveler tips, and tourist information, refer to the Dublin trip itinerary builder app . Chicago, USA to Dublin is an approximately 11-hour flight. Due to the time zone difference, you'll lose 6 hours traveling from Chicago to Dublin. In May, Dublin is a bit cooler than Chicago - with highs of 59°F and lows of 43°F. On the 21st (Mon), you'll travel to Kilkenny. You've now added Kilkenny Castle to your itinerary. Kick off your visit on the 21st (Mon): take in the spiritual surroundings of St. Canice's Cathedral & Round Tower, then get to know the fascinating history of Butter Slip, then step into the grandiose world of Kilkenny Castle, and finally contemplate the long history of Jerpoint Park. To see traveler tips, maps, and more tourist information, go to the Kilkenny driving holiday app . Traveling by car from Dublin to Kilkenny takes 1.5 hours. Alternatively, you can take a train; or take a bus. 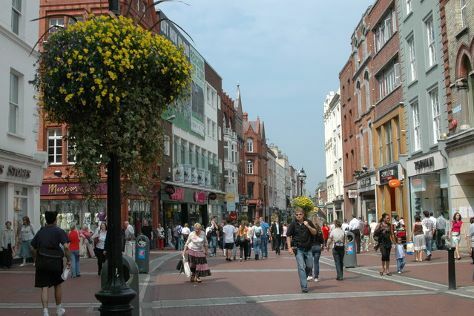 Expect a bit warmer evenings in Kilkenny when traveling from Dublin in May, with lows around 49°F. Finish your sightseeing early on the 21st (Mon) to allow enough time to drive to Killarney. You've added Courtney's Bar, Ladies' View, Ring of Kerry, and other attractions to your itinerary. There's more to do: explore the historical opulence of Ross Castle. To find other places to visit, traveler tips, photos, and tourist information, use the Killarney planner . You can drive from Kilkenny to Killarney in 2.5 hours. Alternatively, you can take a bus; or take a train. In May, plan for daily highs up to 59°F, and evening lows to 48°F. Finish up your sightseeing early on the 25th (Fri) so you can go by car to Limerick. Start off your visit on the 26th (Sat): look for all kinds of wild species at Dromore Wood Nature Reserve and then step into the grandiose world of Bunratty Castle & Folk Park. 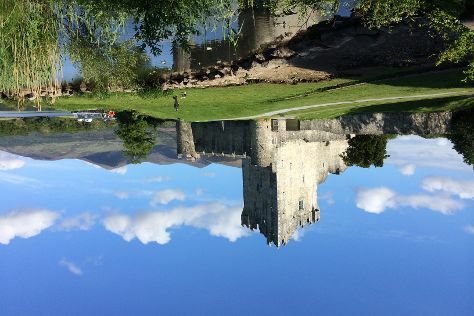 Plan trip to Limerick with our itinerary maker to find out where to go and what to do. You can drive from Killarney to Limerick in 1.5 hours. Another option is to take a bus. May in Limerick sees daily highs of 60°F and lows of 46°F at night. Cap off your sightseeing on the 27th (Sun) early enough to catcht the bus to Shannon. Shannon or Shannon Town, named after the river near which it stands, is a town in County Clare, Ireland. To see other places to visit, reviews, more things to do, and more tourist information, read our Shannon trip itinerary planner . Shannon is just a short distance from Limerick. May in Shannon sees daily highs of 60°F and lows of 46°F at night. You'll set off for home on the 27th (Sun).